Nothing much is surprising anymore. The Syrian Arab Army recently liberated Deir Ezzor from its ISIS occupation amidst the joy and jubilation of its captive population. Syrian resident Lilly Martin explains that people have been dying of hunger and illness for years now but that now they are FREE. Trucks carrying food and supplies are rolling in to feed those who have been starving for years, reports Martin. (s)everal Russian soldiers were killed fighting ISIS in the last few days there, not to mention others who gave their lives and limbs to FREE Syria from the occupation and tyranny of ISIS and other Radical Islamic terrorists. Thank GOD from whom all blessings flow. Syria will now begin celebrating a huge VICTORY. 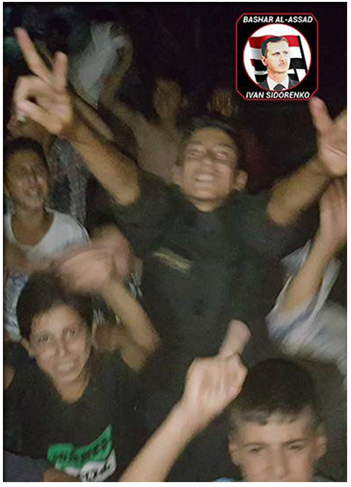 Pictures and videos are emerging which show the jubilation of Syrians finally freed from their NATO terrorist captors, and their relief is palpable. None of this is surprising. We’ve known who the terrorists are and the atrocities that they have been committing for some time now. Any population freed from the torture, the executions, the starvation, the Sharia law, the coercion, the fear, and the hatred would be relieved. The reaction from Washington and its allies isn’t surprising either. Washington is aiding its ISIS field commanders and evacuating its agents for use in other areas. We’ve seen all of this before. (o)n August 26, the United States Air Force helicopters evacuated two European ISIS commanders along with their families from the settlement of Al-Treif, which is located to the north-west of Deir Ezzor. In addition, on August 28, the international coalition aviation relocated more than 20 ISIS commanders from AlbuLeil village to a military airbase in northern Syria. The Washington-led coalition and its allies, drenched in high crimes and remorseless, may one day say that “it was a mistake”, but they will never apologize for the holocaust that they have created. Their pathetic overtures in defeat are testimony this. Facebook message shared with friends, September 5, 2017. Sophie Mangal,“U.S. Rescues ISIS Field Commanders in Syria. “The Terrorists R Us.’ “ Global Research, September 5, 2017. (http://www.globalresearch.ca/u-s-rescues-isis-field-commanders-in-syria-the-terrorists-r-us/5607626) Accessed September 5, 2017. Global Research announces the forthcoming release of the print edition of Mark Taliano’s Book, “Voices from Syria” which includes two additional chapters.